Karen Heath Clark is an historian more by passion than career. She received a Bachelor of Arts degree in history from Stanford University, after spending her first two collegiate years at Pomona College. She received a Master of Arts degree in history from the University of Washington. Her field of specialization was Modern Europe, particularly the first half of the 20th century and her dissertation explored the attitudes of the British public about Adolf Hitler in the 1930s. She spent several years teaching World History and Latin American History at Henry Ford Community College in Dearborn, Michigan. Faced in the early 1970s with the option of pursuing a Ph.D. in history, she opted out. Her permanent residence was the small college town of Ann Arbor, Michigan, full in the early 1970s with over-educated historians with doctorate degrees all competing for the meager number of academic jobs nearby. The chances were so slight that she would be able to snag a job as a newly minted Ph.D. at either University of Michigan or nearby Eastern Michigan that she decided to look for other opportunities. In those early-feminist days, women still followed their husband’s careers not vice versa, and her husband was seemingly permanently ensconced in Ann Arbor on a tenure track in the Department of Geology at the University of Michigan. She looked around at the possibilities and elected to attend law school, especially since Michigan Law School was one of the highest ranked in the nation. After graduating with high honors from Michigan Law School, she accepted a position at the international law firm of Gibson, Dunn & Crutcher, LLP – dragging her now-tenured husband along with her – and retired twenty-five years later as a partner in the firm and the chair of her department in the firm’s Orange County, California office. In addition to loving history, Ms. Clark became a political junkie. She served for almost twenty years on the Board of Directors of the Orange County Democratic Foundation, as well as serving for twenty-five years on the Board, often as Chair, of a bi-partisan political action committee supporting women candidates for local and state-wide office. Her life has at times been fleetingly interwoven with the life of Bill Clinton and some of the other players in this biography. She has had the privilege of meeting Bill Clinton various times, as well as Hillary Clinton, whom she first met when tagged with the duty of shepherding Hillary through a crowd of fans at a local fund-raiser. She attended the first fundraiser held by Bill Clinton in conservative Orange County, California and then followed with great interest the local responses to Clinton’s visit that ensued. She attended both of Bill Clinton’s inaugurations. Of the various other presidents mentioned in this biography, she has had personal interactions with Richard Nixon, Gerald Ford, George H. W. Bush and Barack Obama. She is a law partner of Theodore Olson, one of Clinton’s avid conservative pursuers. Kenneth Starr, the Whitewater special prosecutor, was once a partner at her law firm, but unlike Ted Olson, she did not know him personally. Her life has touched other history-makers who appear in the biography. Her childhood home was only blocks from the home of Rodney King, the man whose beating by the Los Angeles police resulted ultimately in the riots that cast a pall over the aspirations of President George H. W. Bush to win a second term of office. Her husband was in Clinton advisor David Gergen’s class as an undergraduate at Yale, as was David Boren, later the Democratic Senator from Oklahoma who voted against Clinton’s budget bill to defend the oil interests in his state. In addition to her legal career and involvement in politics, Ms. Clark has served as a Trustee of the Newport Beach Public Library and on the Board of the Newport Beach Public Library Foundation. She has served on the Board of Directors of many other non-profit organizations including Planned Parenthood of Orange and San Bernardino Counties (women’s reproductive health), Human Options (serving women who have suffered spousal or partner abuse), New Directions for Women (providing rehabilitation services for women with problems with alcohol or drugs), The Freedom Writers Foundation (training of teachers to serve under-privileged youth), and was a long-time participant on the Dean’s Advisory Council in the School of Humanities at the University of California Irvine (the School at UCI that houses the History Department). Ms. Clark previously published a book chronicling her eight-year odyssey on the Mediterranean Sea with her husband on their own small boat, entitled Mediterranean Summers, How a Man, A Woman and a Dog Spent Eight Summers Exploring the Ancient Sea in a Small Boat. She has published frequent travel articles and gives speeches about her travels. An avid adventurer since her childhood running rivers in Utah and camping in Arizona and New Mexico to visit Native American reservations, Ms. Clark and her husband have trekked in Nepal and the High Atlas Mountains in Morocco; hitchhiked through Greece and the former Yugoslavia where they slept on beaches and in fields along the way; traversed Siberia on the public version (no English spoken) of the Trans-Siberian Railway; bounced along barely-existing roads to explore the steppes of western Mongolia; slept overnight in a guard tower on a remote part of the Great Wall of China; kayaked over dangerously freezing waters to reach and observe brown bears in Alaska; bicycled beside dangerous grizzly bears that were far too close for comfort in Denali National Park; and taken a self-organized round-the-world trip as part of her husband’s sabbatical year in Australia that took them and their then two-year-old son through Fiji, New Zealand, Australia, Mauritius, Madagascar, Kenya, Tanzania, Zambia, South Africa, Brazil, Bolivia and Peru. 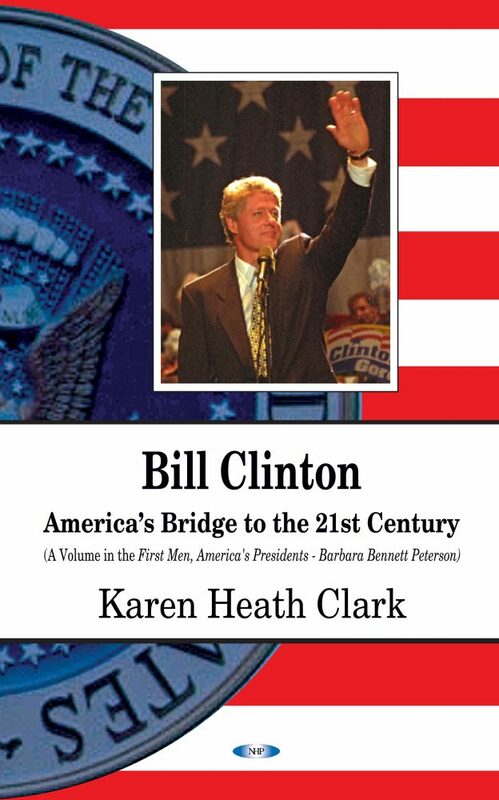 Perhaps the greatest of her adventures was writing this biography, partly because it was such a different task than what she encountered in her career as an attorney, and partly because of the revelations and insights she discovered about the Clinton era. She learned that, although she had lived through the Clinton presidency, she had never truly understood the full story of Bill Clinton. Ms. Clark lives with Dr. Bruce Clark, her husband of almost 50 years, in Corona del Mar, California, only an hour from the town of Altadena where she grew up. They met at Stanford University when she was an undergraduate and he was studying to earn his Ph.D. in geology. After ten years at the University of Michigan in Ann Arbor, he joined and eventually became the CEO of a geology and engineering consulting firm with offices throughout Southern California, where he could pursue his geologic specialties up close, especially earthquakes and landslides. Ms. Clark and her husband have two children, Adam and Andrea. Adam was born a few months before Ms. Clark enrolled in law school, and Andrea was born during the summer between her second and third years of law school, while she was working as a summer legal intern. Her daughter followed in her footsteps to become an attorney now working at a law firm in Sacramento and her son is a computer whiz at a non-profit institute in Seattle. The couple now has a pint-sized army of grandchildren – Sienna, Wesley, Logan and Nicole. Karen Heath Clark is an historian more by passion than career. She received a Bachelor of Arts degree in history from Stanford University, after spending her first two collegiate years at Pomona College. She received a Master of Arts degree in history from the University of Washington. Her field of specialization was Modern Europe, particularly the first half of the 20th century and her dissertation explored the attitudes of the British public about Adolf Hitler in the 1930s. She spent several years teaching World History and Latin American History at Henry Ford Community College in Dearborn, Michigan. Faced in the early 1970s with the option of pursuing a Ph.D. in history, she opted out. Her permanent residence was the small college town of Ann Arbor, Michigan, full in the early 1970s with over-educated historians with doctorate degrees all competing for the meager number of academic jobs nearby. The chances were so slight that she would be able to snag a job as a newly minted Ph.D. at either University of Michigan or nearby Eastern Michigan that she decided to look for other opportunities. In those early-feminist days, women still followed their husband’s careers not vice versa, and her husband was seemingly permanently ensconced in Ann Arbor on a tenure track in the Department of Geology at the University of Michigan. She looked around at the possibilities and elected to attend law school, especially since Michigan Law School was one of the highest ranked in the nation. After graduating with high honors from Michigan Law School, she accepted a position at the international law firm of Gibson, Dunn & Crutcher, LLP – dragging her now-tenured husband along with her – and retired twenty-five years later as a partner in the firm and the chair of her department in the firm’s Orange County, California office. In addition to loving history, Ms. Clark became a political junkie. She served for almost twenty years on the Board of Directors of the Orange County Democratic Foundation, as well as serving for twenty-five years on the Board, often as Chair, of a bi-partisan political action committee supporting women candidates for local and state-wide office. Her life has at times been fleetingly interwoven with the life of Bill Clinton and some of the other players in this biography. She has had the privilege of meeting Bill Clinton various times, as well as Hillary Clinton, whom she first met when tagged with the duty of shepherding Hillary through a crowd of fans at a local fund-raiser. She attended the first fundraiser held by Bill Clinton in conservative Orange County, California and then followed with great interest the local responses to Clinton’s visit that ensued. She attended both of Bill Clinton’s inaugurations. Of the various other presidents mentioned in this biography, she has had personal interactions with Richard Nixon, Gerald Ford, George H. W. Bush and Barack Obama. She is a law partner of Theodore Olson, one of Clinton’s avid conservative pursuers. Kenneth Starr, the Whitewater special prosecutor, was once a partner at her law firm, but unlike Ted Olson, she did not know him personally. Her life has touched other history-makers who appear in the biography. Her childhood home was only blocks from the home of Rodney King, the man whose beating by the Los Angeles police resulted ultimately in the riots that cast a pall over the aspirations of President George H. W. Bush to win a second term of office. Her husband was in Clinton advisor David Gergen’s class as an undergraduate at Yale, as was David Boren, later the Democratic Senator from Oklahoma who voted against Clinton’s budget bill to defend the oil interests in his state. In addition to her legal career and involvement in politics, Ms. Clark has served as a Trustee of the Newport Beach Public Library and on the Board of the Newport Beach Public Library Foundation. She has served on the Board of Directors of many other non-profit organizations including Planned Parenthood of Orange and San Bernardino Counties (women’s reproductive health), Human Options (serving women who have suffered spousal or partner abuse), New Directions for Women (providing rehabilitation services for women with problems with alcohol or drugs), The Freedom Writers Foundation (training of teachers to serve under-privileged youth), and was a long-time participant on the Dean’s Advisory Council in the School of Humanities at the University of California Irvine (the School at UCI that houses the History Department). Ms. Clark previously published a book chronicling her eight-year odyssey on the Mediterranean Sea with her husband on their own small boat, entitled Mediterranean Summers, How a Man, A Woman and a Dog Spent Eight Summers Exploring the Ancient Sea in a Small Boat. She has published frequent travel articles and gives speeches about her travels. An avid adventurer since her childhood running rivers in Utah and camping in Arizona and New Mexico to visit Native American reservations, Ms. Clark and her husband have trekked in Nepal and the High Atlas Mountains in Morocco; hitchhiked through Greece and the former Yugoslavia where they slept on beaches and in fields along the way; traversed Siberia on the public version (no English spoken) of the Trans-Siberian Railway; bounced along barely-existing roads to explore the steppes of western Mongolia; slept overnight in a guard tower on a remote part of the Great Wall of China; kayaked over dangerously freezing waters to reach and observe brown bears in Alaska; bicycled beside dangerous grizzly bears that were far too close for comfort in Denali National Park; and taken a self-organized round-the-world trip as part of her husband’s sabbatical year in Australia that took them and their then two-year-old son through Fiji, New Zealand, Australia, Mauritius, Madagascar, Kenya, Tanzania, Zambia, South Africa, Brazil, Bolivia and Peru. Perhaps the greatest of her adventures was writing this biography, partly because it was such a different task than what she encountered in her career as an attorney, and partly because of the revelations and insights she discovered about the Clinton era. She learned that, although she had lived through the Clinton presidency, she had never truly understood the full story of Bill Clinton. Ms. Clark lives with Dr. Bruce Clark, her husband of almost 50 years, in Corona del Mar, California, only an hour from the town of Altadena where she grew up. They met at Stanford University when she was an undergraduate and he was studying to earn his Ph.D. in geology. After ten years at the University of Michigan in Ann Arbor, he joined and eventually became the CEO of a geology and engineering consulting firm with offices throughout Southern California, where he could pursue his geologic specialties up close, especially earthquakes and landslides. Ms. Clark and her husband have two children, Adam and Andrea. Adam was born a few months before Ms. Clark enrolled in law school, and Andrea was born during the summer between her second and third years of law school, while she was working as a summer legal intern. Her daughter followed in her footsteps to become an attorney now working at a law firm in Sacramento and her son is a computer whiz at a non-profit institute in Seattle. The couple now has a pint-sized army of grandchildren – Sienna, Wesley, Logan and Nicole.